A bitter debate is raging over whether female lacrosse players should wear helmets, as their male counterparts do. 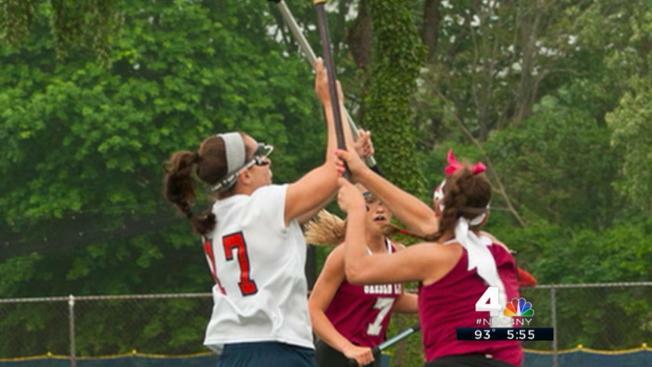 Women's lacrosse is not considered a contact sport. Still, a recent study of high school and college students of both sexes found female lacrosse players get more concussions than anyone other than football players. Concussions account for about one in four injuries that female lacrosse players get, research shows. Armed with such facts, state officials in Florida last month began requiring a soft form of headgear for every female playing in a lacrosse game or practice. But despite widely acknowledged risks, the I-Team learned there is vehement resistance among many players, parents and coaches to requiring helmets. Many argue wearing helmets would only encourage girls to play more aggressively and ultimately lead to more injuries. "If girls start to wear helmets, other girls will feel like they can check more," said Erin Vaughan Ware, who has been playing lacrosse since she was in third grade. Jacklyn D'Avella said she does not think a helmet would have prevented the four concussions she got in lacrosse through her high school and collegiate careers. The University of Pennsylvania freshman said her injuries may have been worse if the game was more aggressive. A concussion last year -- from a blow to the head from a hockey stick -- promoted D'Avella to quit the game. Her doctors suggested it was time to stop and she listened to them. "After I was hit the first time it took only two weeks to recover," she said. "After my fourth, it took two months." Doctors says concussions like the ones suffered by D'Avella can have potentially life-altering consequences. "Repeated concussions can result in cognitive change, changes in balance, chronic headaches and increased risk of depression and anxiety," said Dr. Gad Klein of the Long Island Concussion Center. Joe DeSimone, who owns Lacrosse Unlimited in Manhasset, said it makes sense for female players to wear helmets. But he said even the soft helmets he carries for girls are not big sellers in his store. "With the technology in lacrosse, and sticks, and how fast kids can swing these days, it's impossible to play without a helmet," DeSimone said. The only protective equipment most girls wear on their heads is goggles, he said. Steve Timko, who heads the New Jersey State Interscholastic Athletic Association, which sets rules for high school sports in the Garden State, said he is not likely to mandate a hard helmet. "What type of helmet would that be and is that one that will create more of a liability?" he asked. "Anything that provides a safety aspect, I'm for it, but we haven't seen the injury factor here in New Jersey that would justify that." National injury statistics show that male players who wear helmets are almost three times more likely to suffer head injuries than women. Jenna Davis, a former college lacrosse player and current coach, agreed safety is important but she's not sure helmets are the answer. She says it's about better training and playing smarter.